Really not sure you will have to reshape the fronts of your forearms, remember once glued you need to get your hands through the opening. Cover strips should lay flat and be just short of the raised edges. I have small forearms and have some foam inside to stop the forearms from moving around. I would highly suggest losing that return edge around the area below and making the "scoop" larger as seen below. You will have your arms bent most of the time carrying your E-11, and it can will dig into you ("armor bite"). This is something you want to do before final fitting. Haven't done much on my build yesterday or today. I guess I realized that I cannot rely too much on referencing my RS armor. Some armor pieces (like the forearms) are shaped very differently which I realized I was going to have to do some extreme shaping of the left forearm to make it look like the RS. But that is not the point. WTF is supposed to be different, it is a fan sculpted version. I spent time trying to reshape my left forearm and kind of distorted the shape. I am leaving the left forearm alone for now and tomorrow, I am going to just do the normal cuts on the right forearm and see how it naturally comes together. Before I try and put the right forearm together I am going to browse over a few more WTF threads. So I learned a small lesson and it might have cost me ruining a left forearm. But I have a job and I can get it replaced if it is not recoverable. Anyways, I really do appreciate the few of you who are checking up on this build. This build will take a minute and it makes me feel a bit more confident as I get some inputs. the last update for today, right before I received the kit my neck seal arrived in the mail from Geeky Pink's Phantastic Gaskets. Here is a picture of the fit. I was not sure where to go for various parts of my soft goods and stumbled across Geeky Pinks, it was also nice that she made the based on your neck measurements! I think it fits very well. One part of my soft goods down! Using heat on plastic is an art and it can go from being slightly flexible to a molten mess, remember the plastic was stressed after heating and can start to return to it's natural state when reheated, I always suggest trying on off cuts first. Personally I find you have a lot more control with a heat gun, although it gives more heat than a water bath you can vary which sections are heated, giving a little pressure to say a round forearm then apply some heat it will gently go oval. Can't go wrong with Pinky's neck seals, looks great. I have been trooping for a few months now and I am always accompanied by my wife (handler and taking pictures). She started to really get into the 501st and has been wanting to join for months. I told her once my Walt's TK is done we will get either a TK or a scout for her. I also said if we happened to find a TK for sale that happened to closely fit her short body, then we could do that as well. As it so happened someone was selling their 501st approved sandtrooper outfit and it was not too ill-fitting on her. Seems like just a little bit of work and it would fit her pretty well. Anyways, the traveling and deciding on going forward with the purchase has taken most of my Friday and Saturday. I guess I'll be able to work on my WTF tomorrow. 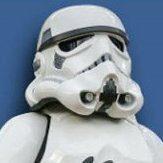 Also, the money diverted to the sandtrooper only means I might have to wait for an extra paycheck before I continue to get soft goods and soft hand guards. Just so you can see I have done a little bit of bending. My RS is PVC plastic and Walt's is ABS. I think that (along with minimal experience) made me mess up on the left forearm. The PVC was a lot easier to get to a bendable state. I n my opinion, PVC is a little easier to mess with. The next time part I need to heat bend, I will take extreme caution. As you have done it's a great idea to use a plug/template to use as a guide when forming, for smaller areas I use a couple of blocks of wood one on either side which I can hold together once the plastic is headed, great for edges too. But after assembly and some extra trimming of inside elbow scoop it actually fit ok. Holding each piece on your body is a little different then it put together. Loose the two pieces formed a oval looking mess that didn't line up. Once together it seemed to round out a bit more. Great choice in neckseal. Teresa does some top notch work! Also nice score for your wife. Looks like you both will need new wrangler/photographer. Keep up the great work! And know we're always watching. It's going to be a rough week for me, but my goal is to try and do something, even if its a little during the week. 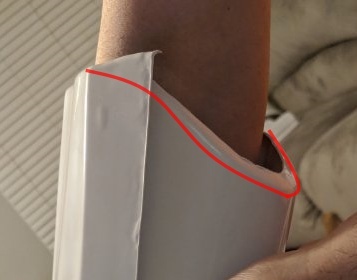 I knew I didn't have time to heat and correct my left forearm so I decided to cut my right forearm to be ready to just cut down the "cover strip edges" to be ready to try and size/shape at a later time. CRL states no return edge at the wrist opening for centurion. I removed the return edge wrist side (just need to sand to smooth out) and left minimum return edge on the opposite side. That's it for the right forearm for now. Another thing I noticed is that I might cut just an extra sliver off the lower crotch area. My upper thigh seems to graze against it. I won't cut anymore until the strapping phase. I intend to heat up the upper left area and then press down on that area and that should even the upper chest area. I would like to hear some opinions on this. I might hold off until I am in the fitting part of my build. The issue I see with trying to bend that area is that the return edge will prevent it. If you do manage to bend it via a heat source, it will put a lot of stress on the area (see arrow) and cause the return edge to buckle. This will create an area that will more than likely split or crack the plate at some point (trust me). The alternative is to remove the return edge, which will make it much easier to bend. If you decide to go that route, be sure to remove the edges on both sides so that they match. Also, it may be a strange camera angle, but are both your chest plate tabs the same length? The right one seems to be shorter. You may be over engineering what you have, I've cut my armor to the minimal trim lines and I have loose sections, seems we have a similar frame, I have some foam in the forearms and biceps to stop them rotating and flapping, and foam behind my ab which helps keep the ab and chest align much better. I hope I'm not too late to the party here! I had many of the same issues with my WTF that you are having on your WTF kit. If you haven't shaped your forearms yet, may I offer a tip? (I remember how badly oval-shaped the WTF forearms are.) I suggest assembling the fronts of the forearms together first by gluing an inner cover strip. Tape the heck out of the outside seam, though. This will allow you to clamshell-fit your forearm securely for width. All sizing adjustments for width take place on the back seams. Once you've got it properly sized and trimmed for width, glue an inner cover strip to the inside back seam (taping the heck out of the outside seam again). Then boil up some water and knock that oval into rounded submission! Inner cover strips add a lot of strength to the forearms, and allows you to get some decent hot-water shaping done without falling apart. Sidenote, congrats on recruiting your wife with her TD! She looks great! Hey Cricket! Thanks for your advice. And you are not late to the party at all. This is my first build so I am taking it slow and my job loves taking up most of my time. Your RS build thread was one of the first threads I ran into and I implemented a couple of things your thread when I resized the torso of my RS (I think it might be good enough for expert infantry). Anyways, I might try the forearm thing this weekend ( if I'm feeling cowardly, I might work on the helmet instead ). I guess I will trim it the way it is supposed to be, put my forearm in......if my forearm is swimming in the armor then try and do what you suggested. And thank you! my wife is super excited. She posted a thread on the Sandtrooper forum asking for opinions on making the TD better sized to her body but there were no responses. Fortunately, TK-44678 lives near me and is pretty good with building. We came over and he helped adjust her kit. As soon as she gets some MP-40 pouches she submitting for approval. Once that's done I will have a bit more time to attack my WTF.